Mushrooms are not a part of the traditional Ethiopian diet. I base this assertion on 30 years’ experience eating in Ethiopian restaurants in the US; 10 months in Addis Ababa have not revealed mushrooms as a component of Ethiopian cuisine here either. In Portland, when we first moved to Oregon, Andreas and I walked around an Ethiopian neighborhood in search of some good kitfo. One menu we looked at (I won’t name the restaurant) listed mushrooms as an ingredient in almost every dish. This did not appeal, in fact it sounded downright unappetizing. We ended up at the enjoyable Dalo’s Kitchen instead. I’m still not sure what was up with that one place – they must have had a special deal with a mushroom supplier. In Addis you can find high-priced canned mushrooms at the faranji shops. Pizza restaurants typically offer them as a topping, but we don’t order them because Alekka thinks canned mushrooms are disgusting (I sort of like them because they remind me of the Blondie’s window on Telegraph Avenue where I used to get a slice on the way to class). There is a large Chinese population in Addis, which explains why you can find shiitake mushrooms at some markets, but they are always the dried variety. There is one kind of fresh mushroom you can buy here, however, and that is the oyster mushroom. A little over a year ago five university students in Addis set up an enterprise called Sweet Mushrooms that trains people to grow oyster mushrooms at home. Growers pay 600 birr ($30) to take a one-day course that includes a take-home starter kit. Sweet Mushrooms buys the harvested mushrooms back from the growers and uses them to make mushroom sandwiches, which they sell out of tiny street stands in Addis. The people who grow mushrooms can also sell the mushrooms independently. One of our Ethiopian staff at the school has a friend who brings them to school to sell to the teachers. I bought these from the mushroom lady. According to an article in What’s Out! Addis, Sweet Mushrooms is looking into growing other varieties of mushrooms as well. I’ll be on the lookout for that. 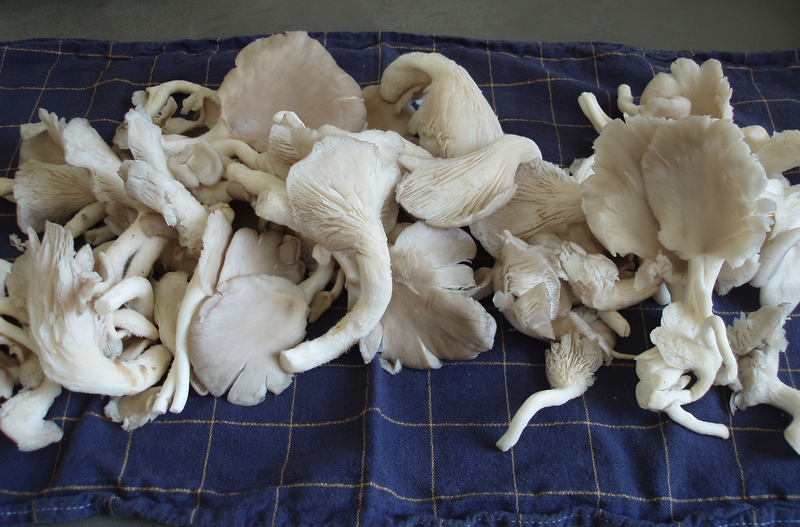 This entry was posted in Addis Ababa, Food, Shopping and tagged oyster mushrooms. Bookmark the permalink. Coincidentally, I am going to a mushroom-growing class this afternoon at the OSU Extension Center. I won’t be making sandwiches out of them though, I think. Well, actually I will because now I won’t be able to stop thinking about that until I try it. Are they good? Actually have not eaten one. I’m not a big fan of sandwiches – I am too much of a bread snob, I’m afraid. I think if I was going to make a mushroom sandwich at home I would grill it with cheese. Hm. Maybe I’ll try that.